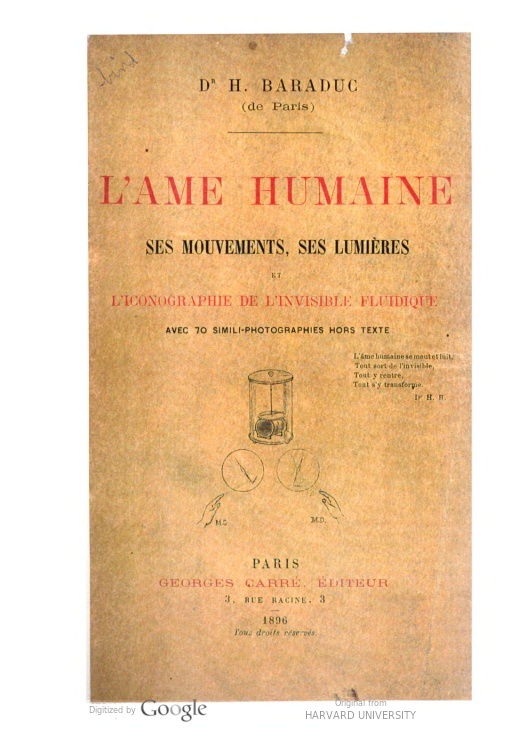 L’Ame Humaine: Ses Mouvements, ses Lumières, et l’Iconographie de l’Invisible Fluidique [The Human Soul: Its Movements, Its Lights, and the Iconography of the Fluidic Invisible] by Hippolyte Baraduc. 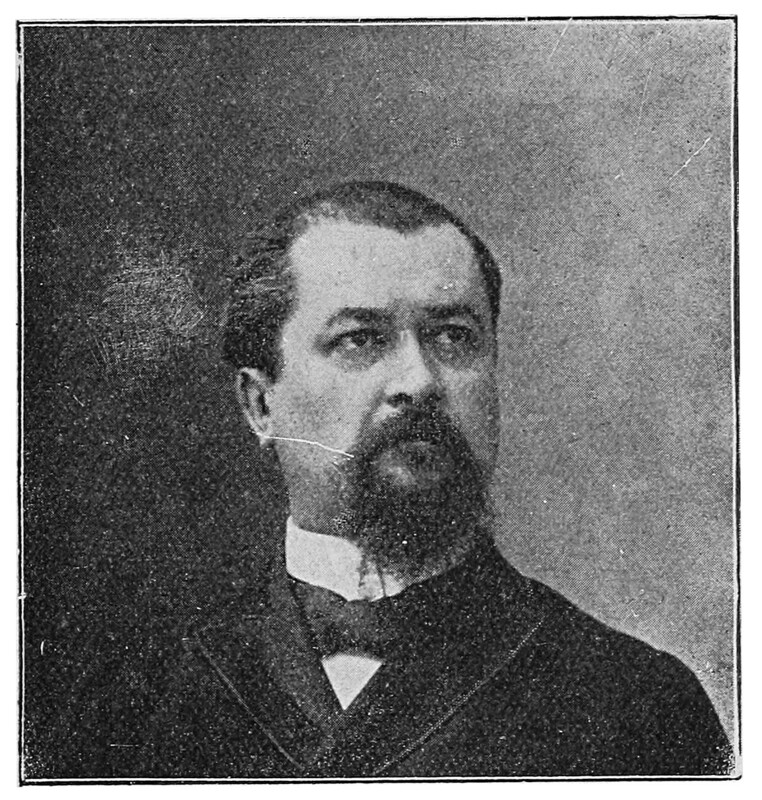 Paris: Georges Carré, 1896. 299 pp. Available free here and here. For an English edition click here. 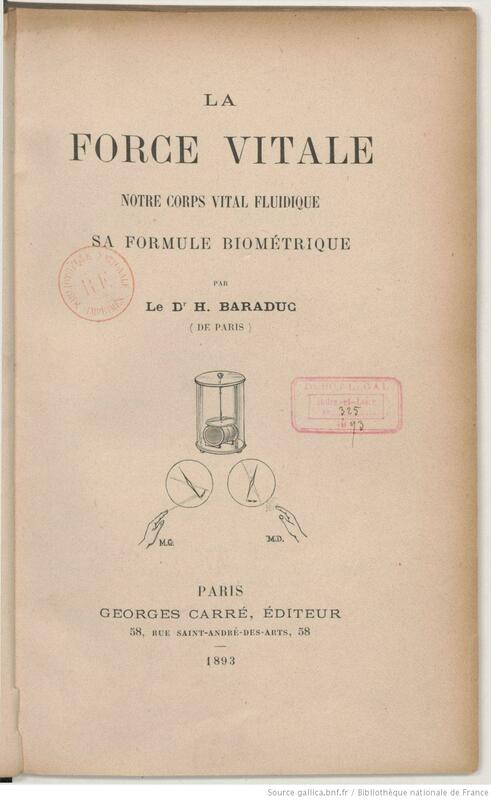 The author started with what he called “biometry,” a topic he explored in a previous book (La Force Vitale: Notre Corps Vital Fluidique, sa Formule Biométrique. Paris: Georges Carré, 1893). This referred to the movements of a needle suspended from a thread believed to define certain patterns reflecting the action of the soul on the physical world. He claimed to have found that the “movements of life” showed seventeen different “formulas.” The latter refers to numerical readings of the instrument corresponding to the right and left hands, which showed attraction and repulsion of the force, respectively. Baraduc claimed he had more than one thousand observations showing that while the right side of the body attracted “cosmic life,” the left one did the opposite, pushed it back. Normal states reflected balance between right attraction and left repulsion. But some “formulas” could indicate particular health problems, including mental conditions. Baraduc believed that his measures were not due to artifacts coming from environmental or body influences. Instead, he wrote, they were due to “our own animic movements, those of the Soul in its physical and psychical manifestations” (p. 26). Other parts of the book were about the photography of invisible forces. With the exception of some electrophotography, this was mainly achieved using conventional photographic equipment taking photos in darkness, hoping that the plaque was affected “by the effluvia, the emanations, the intimate vibrations” (p. 34) of the target object. The soul, usually invisible to the human eye, was believed by Baraduc to be able to impress a photographic plate. He postulated the existence of seven different emanations. The first photo presented was that of a boy feeling sorry for a dead pheasant. 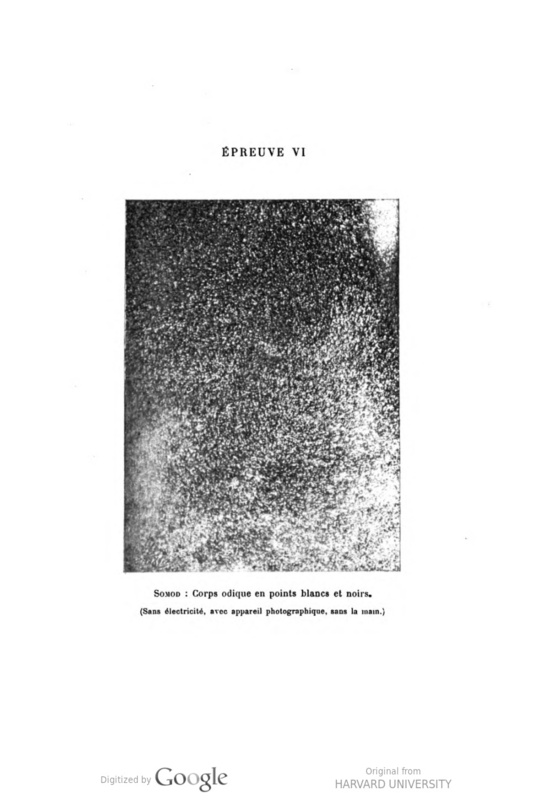 Baraduc claimed that some patterns seen in the photo, similar to marks made by a brush, were a photographic record of the vital force of the child reflecting his animic state. These and many other anomalous photos were seen by the author as proof of the existence of these forces. In addition to Od, which he described as the threads of the cosmic life, he referred to other forces or subtle bodies, among them the ones he called Somod, Psychicon, and Ob. In the Conclusion Baraduc hoped that his readers believed that there was a soul. Unfortunately, his language and assumptions were unclear at best. No empirical evidence was presented for countless affirmations about the nature of these forces and their interactions and functions. An example was the assertion that: “The physical soul is the product of the vital instinct of the inferior cosmos” (p. 288). It is actually very difficult to follow the author’s way of thinking, and his theoretical assumptions seem to take on a life of their own. To complicate matters, in the last pages of the book Baraduc related some of his ideas to religious teachings and to concepts of universal life and its essence. Nonetheless the book is an excellent example of late nineteenth-century Western ideas of psychic forces and their medical and spiritual implications. These comments appeared in my essay review: Unorthodox concepts of force and psychic phenomena. Journal of Scientific Exploration, 2011, 25, 121-130.